Ted Larsen (b. 1964, USA) is an internationally exhibiting artist and Pollock-Krasner Foundation recipient with a BA from Northern Arizona University. The work he creates supply commentary on minimalist belief systems and the ultimate importance of High Art practice. Since 2001, Larsen has used alternative and salvage materials in his studio exercises. 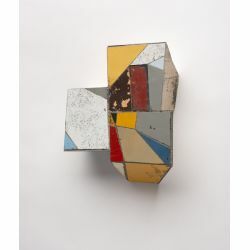 Ted Larsen's work has been exhibited widely in private foundations and museums in the US, including the New Mexico Museum of Art in Santa Fe, The Albuquerque Museum, The Amarillo Museum of Art, The Spiva Center for the Arts in Joplin, Missouri, and the Philadelphia Museum of Art as well as in over 100 gallery exhibitions. He has received grants from the Surdna Foundation and the Pollock Krasner Foundation, as well as residencies with the Edward F. Albee Foundation and Asilah Arts Festival in Morocco, where he was the selected to be the USA representative. He has guest lectured at The South Carolina Governor's School for the Arts in Greenville, South Carolina; University of Art and Design in Santa Fe, New Mexico; The Palm Springs Art Museum, Palm Springs, California; The New Mexico Museum of Art, Santa Fe, New Mexico; Site Santa Fe, Santa Fe, New Mexico; Texas Society of Architects, Dallas, Texas; the Boulder Museum of Contemporary Art, Boulder, Colorado; the Denver Museum of Art, Denver, Colorado. Larsen has been featured in Flash Art, Whitehot, Ocula Art, Art in American, ArtNews, SouthWest Art, Mountain Living, Architectural Digest, Sculpture Magazine, and Art Gallery International magazines. He has had reviews in The New York Times, The Philadelphia Inquirer, The Denver Post, and The Dallas Morning News amongst others. Larsen's work appears in the books Art On The Edge, Biennial Southwest, The Curtain of Trees, New American Paintings, and Millennium Collection. Public Broadcasting Service (PBS) produced an interview with Larsen. Ted Larsen is included in the collections of The New Mexico Museum of Art, The New Mexico Department of Cultural Affairs, The Edward F. Albee Foundation, Proctor & Gamble, The Bolivian Consulate, Reader's Digest, PepsiCo, The University of Miami, The University of Texas, Krasel Art Center, Dreyfus Funds, JP Morgan Chase, Forbes, Lannan Foundation, and Pioneer Hi-Bred, Inc.